(Phys.org) —Geologists continue to puzzle over the how and why of crescent-shaped sand dunes called barchans, found on Earth and on Mars. Barchans can form on the seafloor and on ice, as well as deserts. How do they happen? Why do they not lose their shape? Scientists seeking to understand what keeps these formations going have two recently published papers that can offer detailed explanations of how barchan dune fields can exist, and why they are arranged the way they are. The hitch is that the two papers disagree. A recently published paper by researchers from Duke University say that this is a birthing process, where large dunes give birth to smaller ones. Large dunes birth or "calve" smaller dunes. After sand dunes get big enough, they calve off smaller dunes that keep them from blowing up to infinite size. The baby dune travels down one of its parent's horns and buds off. The team simulated "calving" dunes and recreated real-world barchan patterns for their study. Their findings were published online earlier this month in the journal Geology. The paper, by Stacey Worman and colleagues, is titled "Modeling Emergent Large-Scale Structures of Barchan Dune Fields." The authors stated that "This work supports the hypothesis that calving exerts a first-order control on field-scale phenomena; it prevents individual dunes from growing without bound, as single-dune analyses suggest, and allows the formation of roughly realistic, persistent dune field patterns." A different view appears this month, however, in Geophysical Research Letters where Mathieu Génois of Paris Diderot University and coauthors flesh out a picture of clashing, not calving, dunes. Collisions control dune field behavior. Looking at barchan formations, they said colliding and breaking apart keep the fields from growing out of control. If two barchan dunes collide they merge into one crescent or split up into multiple smaller barchans. They wrote, "Here we use an agent-based model with elementary rules of sand redistribution during collisions to access the full dynamics of very large barchan fields. We tune the dune field density by changing the sand load/lost ratio and follow the transition between dilute fields, where barchans barely interact, and dense fields, where dune collisions control and stabilize the dune field." In 2012, there were signs that Genois and research colleagues were interested in examining the nature of crescent-shaped dunes. That year, the paper was published, "When Dunes Move Together, Structure of Deserts Emerges." "In contrast with the layman's view, " they wrote, "not all deserts are vast sand seas. 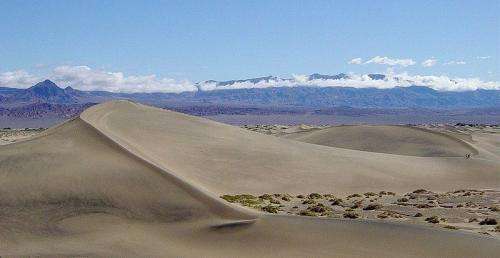 Depending on the variability of the local winds, sand dunes can adopt various shapes. When viewed from above, they mimic large stars, long linear ridges or crescent structures. The-crescent shaped dune, called barchan is a prototypical model of sand dune dynamics…"